SNES Chrono Trigger (USA) in 4:21:11.83 by hero of the day. 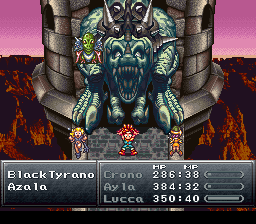 Chrono Trigger is one of the most popular RPGs ever made for gaming consoles. It is also one of the most anticipated tool-assisted speedruns. The criterion for finishing the game is to defeat Lavos. The option to do this becomes available to the player very quickly and remains available almost entirely through the game. The ending seen after winning depends on decisions made in the game and the current point in the plot. Note: This movie goes twice into the same battles again and again for the purpose of building the characters’ levels. These sections reside in the movie at 2:20:02 – 2:23:47 and at 3:37:34 – 3:55:16 (nearly 18 minutes). When watching the movie, you may wish to fast-forward over these parts.